Finding the right horse racing betting site can be a daunting task, especially for American players. There are many racebooks out there that cater to American bettors. But, if you are new to the area of online horse racing betting, it can be hard to tell which ones are legit and which ones are the best. Here at Gambling 360, we’ve tried and tested many online horse racing bookies. The ones that have passed our stringent vetting process have landed upon our best-betting sites list. Stick to these racebooks, and you’ll be rewarded with generous welcome bonuses, cashback promotions, loyalty programs, and much more. Read on to find out about the best betting sites and online horse racing betting. We also answer some frequently asked questions about online horse racing betting. Below are some of the best online horse racing betting sites for American horse racing enthusiasts. These offer the best welcome bonuses, promotions, loyalty programs, customer support, and security and fairness. Racebooks that are serious about getting your attention will offer very generous sign-up or welcome bonuses. Reputable racebooks are willing to match 50% to 100% of your initial deposit. Being able to place a bet from anywhere you are and whenever you want. Betting online earns you bonuses and rewards that wouldn’t be available at the racetracks. Online wagering accounts allow you to be more selective in what you want to bet on. You won’t experience the distractions of a racetrack or off-track parlor. Below we’ll answer some commonly asked questions around horse racing betting sites. Is it legal to bet on horse racing online? Yes, betting on horse racing online is legal in 38 of the 50 states. A 2000 amendment to the Interstate Horse Racing Act of 1978 kept up with emerging technology and allowed for phone and internet horse racing wagering. What is the best horse racing betting site? It’s difficult to pinpoint exactly which horse racing betting site is the best. This depends on what you’re looking for from a racebooks. The sites we’ve listed above offer excellent services to US horse racing bettors. 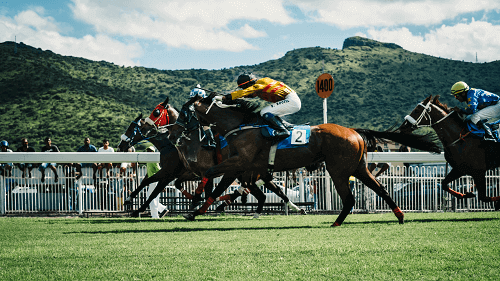 How do you bet on horse racing betting sites? Sign up or login to your favorite horse racing betting site. Go to the race you want to bet on. Place either a single wager (bet on one horse) or an exotic wager (bet on multiple horses). Select the amount you want to wager. You’ll then receive confirmation that you’ve placed your bet. Finally, watch the race and hopefully your horse wins. What states allow horse racing? 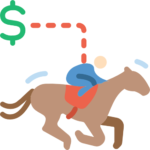 There are 38 states that allow online betting on horse racing: Alabama, Arkansas, California, Colorado, Connecticut, Delaware, Florida, Idaho, Illinois, Indiana, Iowa, Kansas, Kentucky, Louisiana, Maine, Maryland, Massachusetts, Michigan, Minnesota, Montana, New Hampshire, New Jersey, New Mexico, New York, North Dakota, Ohio, Oklahoma, Oregon, Pennsylvania, Rhode Island, South Dakota, Tennesse, Vermont, Virginia, Washington, West Virginia, Wisconsin, Wyoming.